The Czech composer Leo&#154; Janacek is most frequently represented in the current repertory by his operas Jenufa and Kat’a Kabanova, both works of high domestic drama, full of intense emotion and family conflict. The Cunning Little Vixen, far less frequently staged, is in a lighter mood, a fable in which animals often behave like people and the worlds of people and animals are interleaved. San Francisco Opera’s first presentation of the opera is a co-production with the Bergenzer Festspiele and the Grand The�tre de Geneve, a visually stunning design based on a series of archways whose curves contain cylindrical cutouts that serve as sources of lighting as well as, when needed, the entrances to burrows or a fox’s den, from which various animals can appear or exit. Imaginative use of the revolving stage allows various configurations of the archways, suggesting different locations. The curtain rises on a pub scene; a peeling floral wallpaper covers the walls, used also on the archways in later scenes–a visual image that works both for the artificial interiors and the natural forest settings. 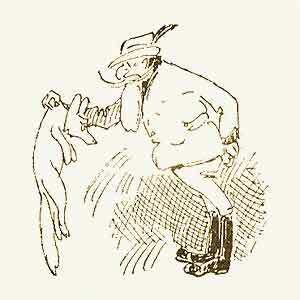 The Forester sings to his rifle ("You don’t grumble; you don’t nag"). At another table in the pub sits an attractive young woman in a coat with a fur collar. She’s the alter ego of the Vixen, who is variously confused by the Forester, the Parson, and the Schoolmaster with their fantasies or memories of real women in their lives. In the forest, the Forester later captures the Vixen and brings it home, where it is disliked by his wife, mounted by the dog, and teased by the children. A wall of cages holds hens while the rooster roams free. In a clearly feminist statement, the Vixen urges the hens to revolt; when that fails she kills the rooster and flees to the woods. In the woods, the Vixen meets a Fox. They fall in love and are married by a woodpecker. Many cubs follow. Ultimately, the Vixen is shot by the Poacher. In the final scene the Forester is back in the forest, observing a young fox cub; he understands the eternal cycle of nature. Here, as in his other operas, Janacek followed his practice of building his music on the sounds and rhythms of the spoken language. There is very little in The Cunning Little Vixen in the way of extended melodic lines. The main exceptions are the duet between the Fox and the Vixen, a shimmering dialogue of courtship and love, and the final aria of the Forester. Throughout, the orchestral sound is rhapsodic, laced with the pastoral rhythms of the forest, from the buzz of insects to a sense of peaceful contemplation. This production effectively uses a dancing human couple, the "spirits" of the Vixen and the Forester, to provide movement during orchestral interludes. For once, the choreography (Aletta Collins) on the opera stage was both appropriate and elegant. Dawn Upshaw sings the Vixen with the clarity, musicality and luminosity that have become her hallmark. Dagmar Peckova made a dashing Fox to woo the vixen; her mezzo-soprano instrument blended perfectly in the duet with Upshaw, the single most satisfying musical moment of the evening. Sir Thomas Allen’s Forester was powerfully and thoughtfully delivered, both vocally and dramatically. The Cunning Little Vixen is not a work of compelling narrative drive. Rather, it is a pastorale, a reflection on nature and the human condition within nature. It raises questions about freedom and captivity, about naturalness and inhibition. The Parson cautions the men not to give their body to women. The Schoolmaster is ineffective in his romantic efforts. But the animals freely multiply. All of these ideas quietly reside in a unified work in which the music and the themes seem perfectly suited, all sustained in a tone of good humored, gentle melancholy. A more convincing production than the one currently at SFO would be hard to imagine.